Our concert on Friday 7th July was our last with Barbara Bancroft directing the choir. Barbara has been our conductor since 2009 when she took over from Doreen Anderson. Before that she sang alto with the Aire Valley Singers since the early 1980s. Charlie Rhodes will be our new conductor from September. Our next concert is ‘Spring in the Aire’ at St John’s Church, Yeadon on Saturday 1st April. Join us at St Paul’s, Shipley on Friday 16th December for our seasonal concert ‘An Aire Valley Christmas’. 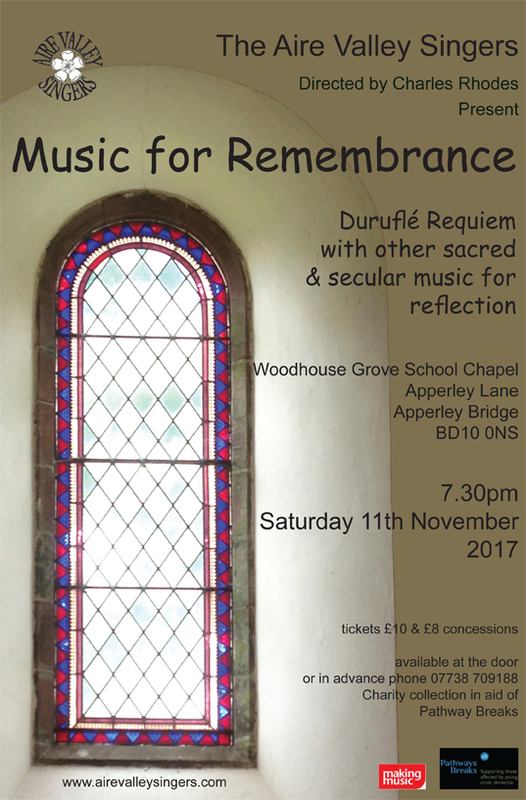 Our next concert will be on Friday 11th November at Saint Paul’s Church, Shipley. Join us on 14th May at West Ardsley Methodist Church for a concert of ancient and modern, sacred and secular choral music. Aire Valley Singers is a 30+ voice chamber choir from Shipley, West Yorkshire, whose repertoire ranges from early to contemporary music.